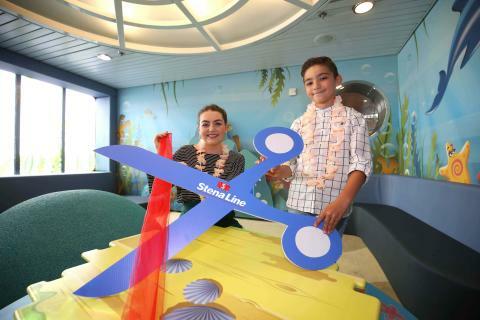 LEADING ferry company Stena Line is ensuring that parents won’t hear any cries of ‘I’m bored’this summer as they launch Summer of Fun, an action-packed schedule of kid friendly events onboard the Belfast to Cairnryan and Belfast to Liverpool routes. Keeping the kids happy has never been easier as Stena Line’s Summer of Fun will provide hours of entertainment with activities such as Happy’s Beach Parties (on selected sailings), free movies and the use of the new Happy World play area and Teen Town video game zone. Happy’s Beach Parties, which take place every Thursday to Monday on the 11.30am and 3.30pm sailings, are jam-packedwith things to do from face painting, beach limbo and PlayStation tournaments to sand art and drawing competitions with great prizes up for grabs! There will also be MEGA Beach Parties on selected Saturdays over the summer (August 4 and 18) where guests will also enjoy live music and free ice-cream. New for Summer 2018 is the new kids play area, Happy World, which has been unveiled in homage to Stena Line’s Mascot, Happy, the friendly porpoise. To celebrate the new play area, Stena Line recently hosted an onboard competition, inviting children to provide drawings of what they thought Happy World would look like and it was 9-year-old Jay Raymond who submitted the stand-out winning drawing. Jay was treated to a VIP trip with his family on the first Summer of Fun sailing where he officially opened the Happy World Play area. Orla Noonan, Travel Commercial Manager (Irish Sea North) said: “Summer is the perfect time to make unforgettable memories with the family and we have developed all of our new activities with this in mind. “We take pride in delivering an excellent experience for our guests and are delighted to launch this exciting initiative which is great for both kids and adults alike,” added Orla. To book on to one of the action-packed sailings go to www.stenaline.co.uk.